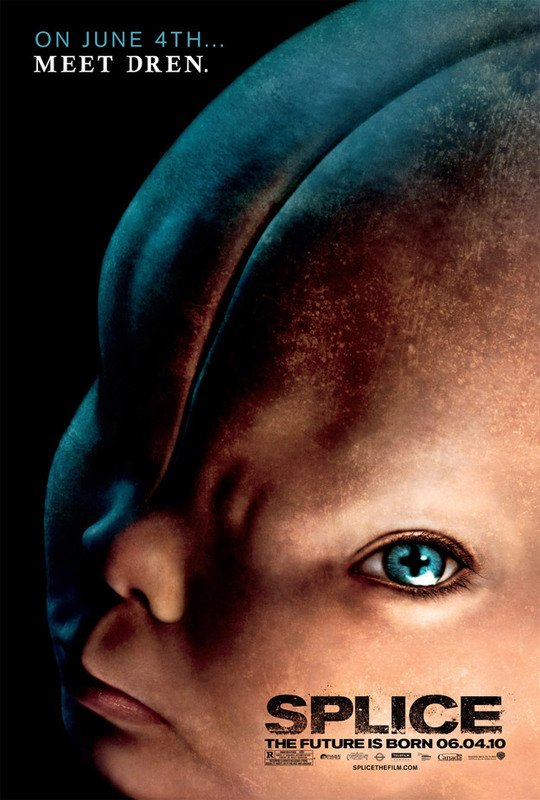 Sneak Peek the new poster supporting the Toronto-lensed sci fi horror feature "Splice". Directed by Vincenzo Natali, "Splice" was picked up for distribution by Joel "Lethal Weapon" Silver and his Warners-based Dark Castle label, after the North American debut of the France-Canadian co-production @ the 2010 Sundance Film Festival, in the 'Park City At Midnight' program. Filmed in Toronto at Black Creek Pioneer Village, Cinespace Film Studios and York University, "Splice" follows 'Elsa' and 'Clive', two young scientists, who defy legal and ethical boundaries, by splicing together human/animal DNA to create a hybrid chimera organism. Named 'Dren', the creature develops from a deformed female into a beautiful winged creature, forging a bond with both creators. Warners will release "Splice" June 4 on 3,000 screens, with marketing support, budgeted between $25-40 million. Dark Castle is optimistic that the genetic mutation thriller will be the next box-office busting "Paranormal Activity".